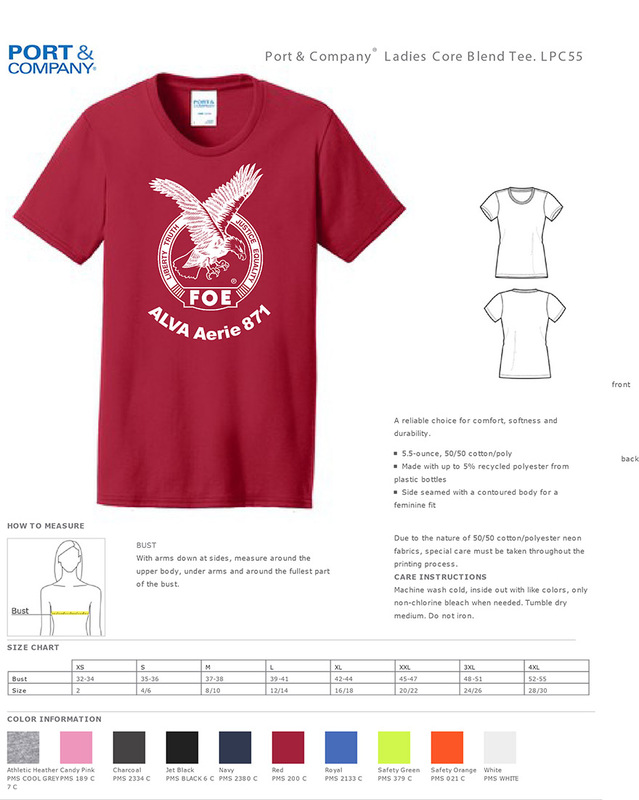 Welcome to Fraternal Order of Eagles ALVA Aerie #871, located in Old Town Alexandria, Virginia. We are a social and funloving group who enjoy spending time with family and friends in Aerie 871’s spacious Rathskeller. We are also a generous and concerned group, giving time, talent and money to many worthy causes. Join us in celebrating our fraternal bonds and the joys of contributing to the community! March 25th is the deadline for early dues payment to help save us money. 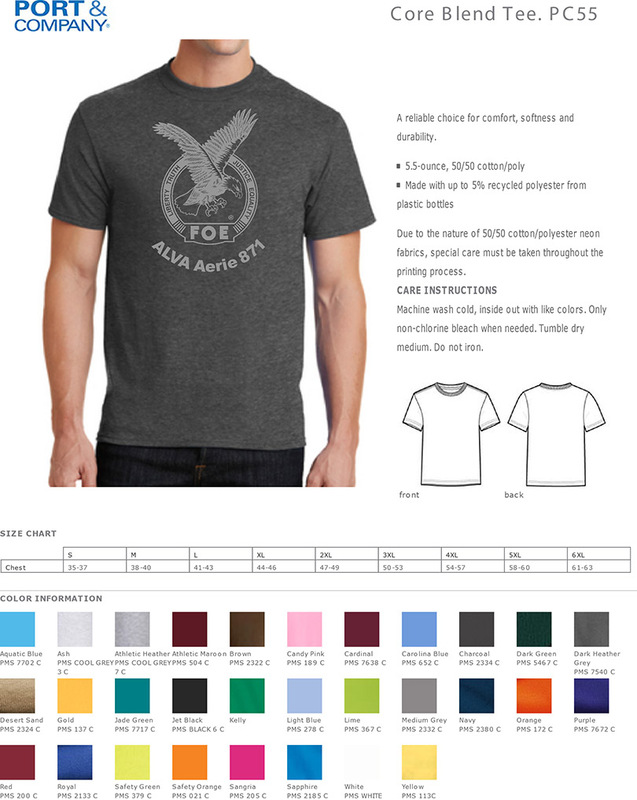 The Grand Aerie will be sending out reminder notices starting on March 26. Please drop by the club and give your dues (cash or check) to the bartender on duty in the Rathskeller or send a check to me made payable to FOE 871 and mail to 1015 Cameron Street, Alexandria, VA 22314 or P.O. Box 491, Alexandria, VA 22313 . Thus far 86 of you have paid your dues and I thank you. There are only 819 of you left to pay. Dues remain at $60.00 and you may pay for more than one year if you’d like. Your dues will expire at midnight on May 31, 2019. Thanking you in advance for your help. 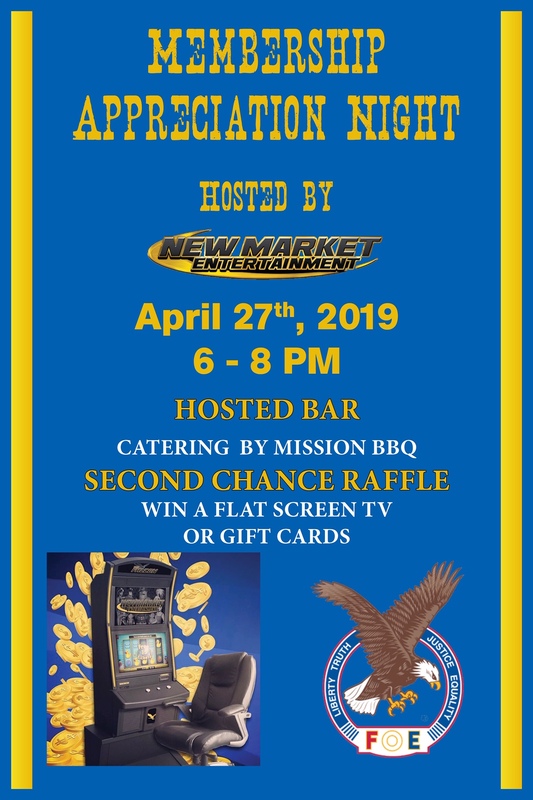 The Trustees have asked me to let you know that starting May 1st if you do not have your key card and have to use the door buzzer to gain entry you will be making a $1.00 donation to the club charity container. If you have lost or misplaced your keycard a new one may be purchased. In addition you must show your membership card to the bartender even if you have been a member for 100 years or risk not being served. The new fraternal year is almost upon us so this will become standard procedure to check for newly issued membership cards. Daily Specials . . .
Monday, April 8: No daily special. Tuesday, April 9: Stay tuned. Wednesday, April 10: Stay tuned. Thursday, April 11: Stay tuned. Friday, April 12: Join us for the Auxiliary Dinner. Saturday, April 13: $2 off pizzas and wings. Sunday, April 14: $1 off hot dogs. 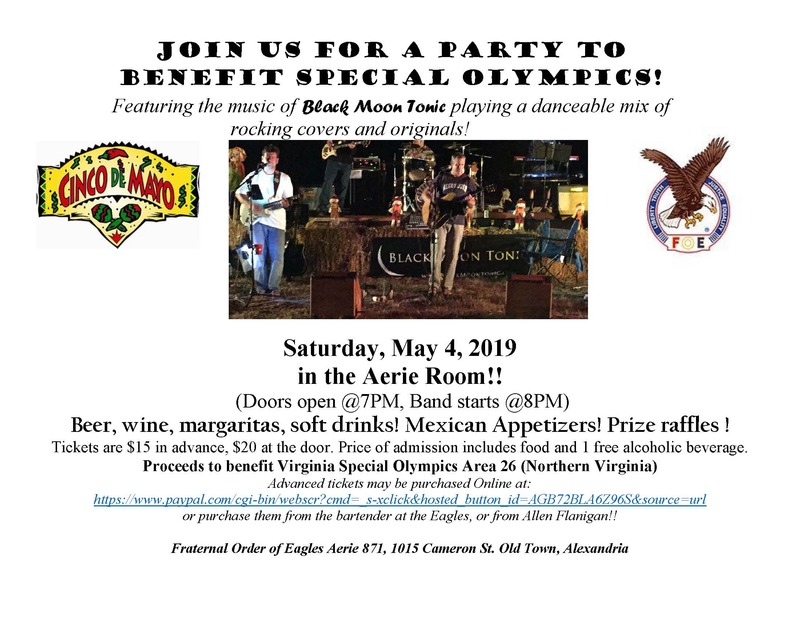 Please join us for Membership Appreciation Night hosted by New Market Entertainment from 6:00 to 8:00 p.m. Buzz and Hope Peele will provide live music beginning at 8:00. Saturday nights are “Date Night” at FOE 871! Take advantage of our parking lot for your excursions into Old Town and join us before or after for a relaxing drink in the Rathskeller.